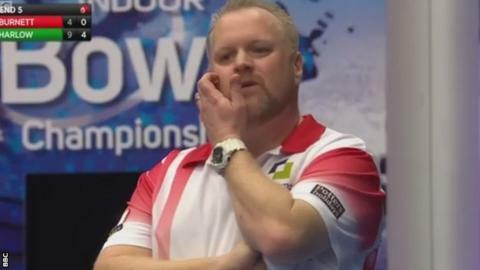 Greg Harlow ended Darren Burnett's dream of a title clean sweep at the World Indoor bowls in Norfolk. The Englishman, the 2010 champion, beat the 2014 winner 9-4 6-6 to move into the men's singles quarter-finals. Commonwealth Games champion Burnett had already won the men's pairs and mixed pairs finals this week and said the heavy schedule had taken its toll. "Greg played very well and deserved to win. I unfortunately did not turn up," the Scot told BBC Sport. "And, if you don't play your best, you are going to struggle at this level. "But it is fantastic to win two world titles. That's me completed the set, so I can't complain." Harlow was delighted with his own game. "I was very comfortable out there and got off to a very good start and that settled me down, but I knew Darren would battle all the way," he said. Harlow now faces fellow Englishman and world number one Nick Brett in the last eight. The run of 19-year-old Englishman Connor Cinato came to an end when he was beaten by unseeded compatriot Jamie Chestney 10-3 8-3. Chestney faces fourth seed Robert Paxton, who beat fellow Englishman Mark Royal 6-7 12-5 2-0. Holder Alex Marshall and former world champion Stewart Anderson both survived tie breakers on Wednesday to reach the quarter-finals. Marshall, who has won the title a record six times, edged out England's Mark Dawes, the 16th seed, 2-1 after two sets finished all square at 7-7. Anderson, the winner in 2013 and seeded ninth, beat English eighth seed Mervyn King, the 2006 champion, 11-2 3-8 2-1. The two Scots now face each other in Friday's quarter-finals. David Gourlay, the 1996 champion who is the sixth seed, faces English qualifier Mathew Orrey after beating fellow Scot Jonathan Ross, the 11th seed, 7-2 9-4. Gourlay next faces Orrey, who beat compatriot Simon Skelton 7-10 7-6 2-1.